The exterior of the house has been transformed from a gloomy dark area to a sunny house. We created the island, and surrounded it with boxwood which is very deer resistant. The center of the island is home to a large fountain. At the front walk we chose to plant lime green juniper to brighten the walkway and create another dimension to the front of the house. The dogwoods also provide some change but a light an airy feel. 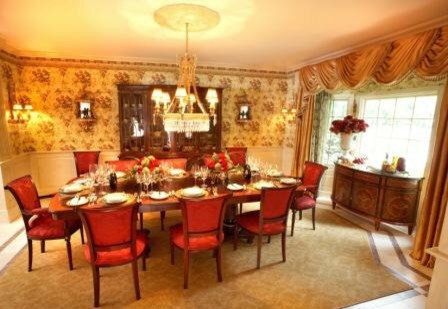 We designed the dining room as per our clients request. Formal and floral. It is in a French Normandy home and we used a beautiful royal red damask patterned fabric for the uphosltered chairs and for the drapery, we used a beautiful silk. The bay window boasts a great inlaid server with fine inlaid detailing. Enjoy! 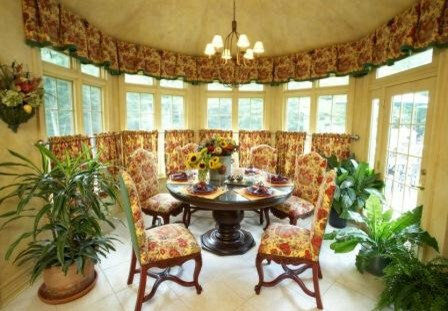 The dining room is formal and floral. 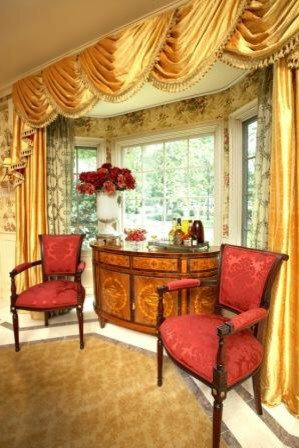 We used a beautiful royal red damask patterned fabric for the uphosltered chairs and for the drapery, a beautiful gold silk. The bay window boasts a great inlaid server. Over top of the dining table hangs a Russian Crystal chandelier. 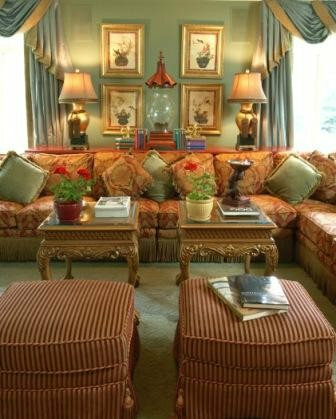 This Great room, featured in Best of Design Today by Shiffer Publishing, showcases our clients taste. We covered the sectional in a soft damask pattern. To keep it formal, we place a bullion fringe at the base of the skirt. In lieu of a coffee table, a pair of painted tea tables with a claw foot base. Opposite them are a pair of skirted ottomans with tassels on the corners. Our color pallette was dicated by the use of the green celedaon, which our client loves. This Great room, featured in Best of Design Today by Shiffer Publishing, showcases our clients taste. We covered the sectional in a soft damask pattern. To keep it formal, we place a bullion fringe at the base of the skirt. In lieu of a coffee table, we chose a pair of painted tea tables with a claw foot base. Opposite them are a pair of skirted ottomans with tassels on the corner. Between the windows we placed a series of asian prints with a pagoda candle holder between. The window treatments which are swags and jabots with side panels, are a silk damak in celadon with a contrasting boarder. In the dining area of the kitchen, we created a floral garden. The mustard is the back drop for the cherry finished chairs with contrasting fabric dining chairs. The backs are a custom green fabric and the seat and inside back are floral. 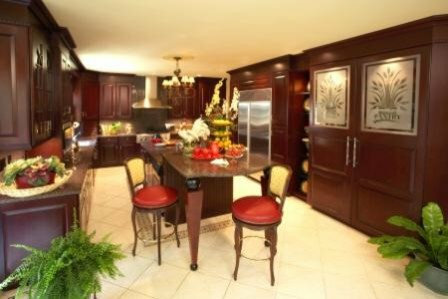 In this kitchen with a center island, was expanded to include a pantry with etched glass doors. The island which includes an area for barstools. The custom barstools include two fabrics a leather seat and an upholstered back seat. In this boys room, a train runs along the perimeter of the room. The window treatment was created as a tunnel made of stone to create the illusion of a train tunnel. The remainder of the room is filled with rust, brown and navy bedding and a striped navy wallpaper. In this girls room we introduced yellow greens and pinks. Weused a balloon window treatment, marble top chests and dresser in a terracotta color, and an english wilton carpert. The duvet cover is a floral on one side with a contrasting plaid on the other side. In this master bedroom, the window treatments were designed to make the windows appear larger. 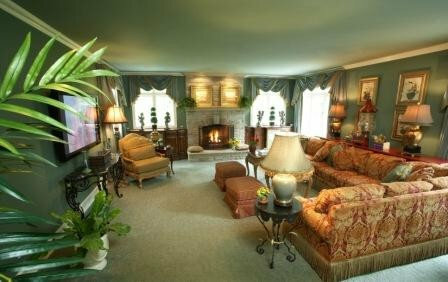 To enter the sitting room, we created a double entrance flanking the fireplace. 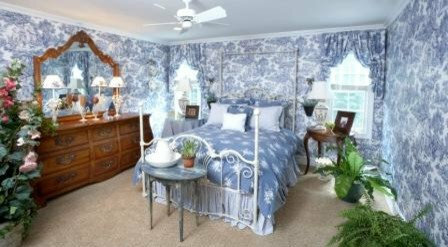 In this guest bedroom, we chose to use toile in blue and white. 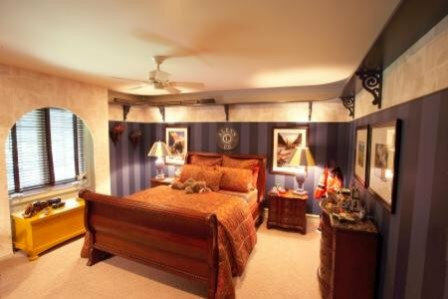 The wallpaper is sets the tone for the room and in is enhanced with the bedding.